Syntec Optics is one of very few facilities worldwide with deep expertise in optical coating technology, molded optics, and design for manufacturability. Using innovative thin film deposition techniques, we offer the right method for your application including optical coating design. • Complete metrology lab lets us systematically test to ensure perfect parts and optimized machine performance (contact profilometry and CMM equipment to measure surfaces plus high resolution interferometers, including white light, to analyze light deformation). • State-of-the-art temp./humidity controlled environment maintains even the tightest tolerances for low stress, dense, and durable thin films. • Proprietary coating design techniques increases accuracy and/or decreases coating times, for significant project savings and outstanding consistency. 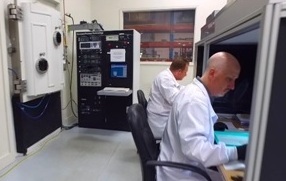 • Last, but not least, a full state-of-the-art laboratory with 44″ Chambers, E-Beam, Plasma Ion Assist and digital control capabilities, both E-guns and accurate deposition controllers, allows us to design and build custom coating fixtures for superb precision optical components. 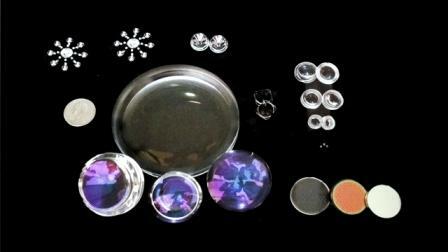 Our core optical coating equipment includes several chambers for a large range of part sizes. All configurations have a rotational planetary system for great flexibility in optical coating complex shapes for reflective Al, Gold, and protected Silver coatings as well as broadband and v-coat anti-reflective. Find reliable precision optical coating services at SyntecOptics.com. From Anti-Reflection Coatings, High Reflective Coatings to Beamsplitter and Filter coatings, we offer the best solutions for your coating applications.